Nancy is 28 years old and lives with her husband in Ochomogo, Nicaragua. Through some friends, Nancy found out about Self-Help International’s micro-credit program. Nancy, skeptical at the idea of the program, decided to simply attend a meeting. She had no idea how it would impact her life. Something happened that Nancy didn’t expect. “I heard about all of the ways the women have benefited from the micro-credit program, and I fell in love with the program right away. Excited and motivated, I went to back to my home and told my mom that I really liked what I learned at the micro-credit program meeting,” Nancy said. Nancy and her mother, Teresa, wanted to join the micro-credit program and the following day attended their first training session. The topics that they could learn were interesting, Nancy explained. She and her mother wanted to learn how to manage a business. Personally, Nancy wanted to learn how to save money, how to improve the quality of her products, how to provide good customer service, and ultimately, how to grow her business. Nancy and Teresa had a business selling used clothes, but they weren’t able to pursue it regularly due to lack of money. 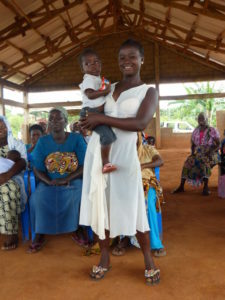 After Nancy joined the micro-credit program, she was given her first loan. Nancy and her mother used the money to purchase more and better quality clothes. Because Nancy and her mother didn’t have customers initially, they began selling their clothes in surrounding communities. With the profits they made, they invested in buying more clothes. They even decided to purchase clothes for children, as they recognized this need in their community. It has been a year since Nancy and her mother started working with Self-Help and received their micro-loan. When Nancy moved away with her husband, she and her mom had to divide their business. Fortunately for them, they are both able to continue selling clothes and keep the business alive in their own separate communities. Every day, Nancy catches the bus at 7 a.m. and returns home at 5 p.m, except for Sundays when she goes to church. Nancy travels to communities such as Picapica, El Mancho, and El Jícaro, Nicaragua She carries her 50-lb bag of clothes wherever she goes, walking from house to house selling them. Nancy talked about a very poor family she met in the community of El Jícaro. She met a 47-year-old woman by the name of Martiza, who has a disability that confines her to a wheelchair. Basically, she lives alone with her 6-month-old baby, as well as a few grandchildren. Nancy decided to help her by leaving some of the clothes she isn’t able to sell. This way, Martiza can try to sell them and earn a commission, and Nancy doesn’t have to carry them all home. “I know that Mrs. Maritza will do her best to sell [the clothes] immediately, in order to make an income to cover some of her needs,” Nancy explained. Even though buying the clothes requires more money, Nancy doesn’t mind because “people really want to dress nicely.” She says she is able to sell her clothes more easily now compared to the lower-quality clothes she sold before. Nancy couldn’t contain her enthusiasm as she spoke about her dreams. She is thinking bigger and beyond than when she first started the micro-credit program. She said she has thought about her retirement and has decided that she is going to use part of her profits to pay for retirement, since she hasn’t been able to get Social Security on her own. She said she will at least be able to pay a monthly rate to cover basic expenses when she does retire. Nancy demonstrates how far you can go when you have a dream, and how far you can go with that dream if you just take a leap of faith. Thanks for sharing your story with us, Nancy, and we wish you the best of luck in your future endeavors!